I’ve sent a little LED dimmer PCB to OSH Park service. For 4.6 USD it is a great deal. 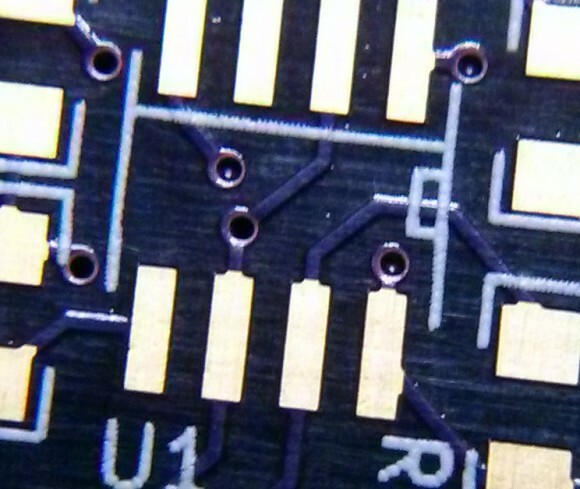 Vias are 0.8 mm in diameter and 0.3 mm drill. SMD components are 0805. The result? Very good. The order was sent on 4.2.2014. Boards were shipped on 13.2.2014 and delivered on 24.2.2014 to Czech Republic. 3 weeks from ordering – not bad! Silkscreen quality is also very nice. They do not provide an e-test. They have an automated optical inspection. People had few issues with OSH Park.